Populists get a bad name. They are accused of riding the wave of public sentiment to disrupt and overturn good, sensible things. Populists can, however, sometimes spot changes before others do—and there are times when that really matters. In all the glare and noise from the populist Donald Trump, the profundity of the change can be lost or obscured. US policy on China is now going through such a time. And that really matters—to the US and to China, certainly, but also for Australia—politically, economically and strategically. I think there are enough signs now to say we’re at the moment when a determined disentangling of the US and Chinese economies has begun. That may be the biggest news we will receive in this generation, aside from global natural disasters or war. There are two main reasons we’re at this profound moment. One is the direction of China under President Xi Jinping. The other is the emergence of a deeper strategic realignment across the US. 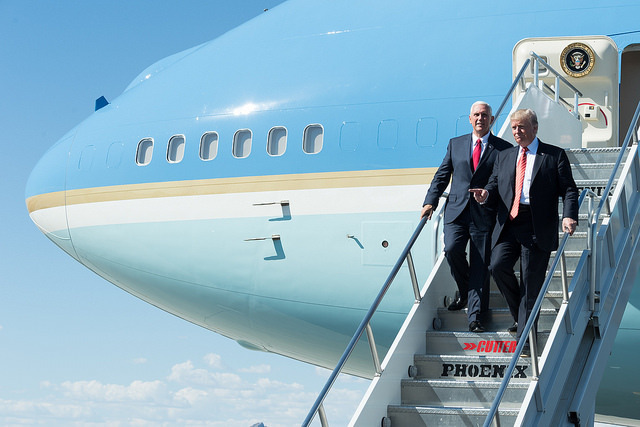 Vice President Mike Pence’s speech  last week is the clearest indication yet that a shift is happening. The bad news for Australia is we don’t seem to yet have a clear position that will let us deal with either—let alone both—of these big readjustments by the world’s two great strategic and economic powers. So far, our policy community has reacted to the Trump ‘America First’ agenda warily and managed events so that there are no high points of disagreement or drama with the Trump administration, perhaps hoping that the fever would break. Our government’s position on the Trump administration’s US$200 billion trade tariffs on China is that it’s a trade dispute, and is best resolved by reinforcing the World Trade Organization’s functions for dispute management. ‘We want to see cooler heads prevail ’. Similarly, while Pence said that the Chinese Luyang-class warship manouevring within 40 metres of the USS Decatur was ‘reckless harassment ’, our government’s position was a call to ‘deescalate  [the situation] and to use our influence and our relationships in the region’. We’ve been stuck defending a status quo that has ceased to exist—where the US and China had a massive, growing economic relationship and were as concerned as anyone else to manage their strategic differences without conflict. We seem not to have yet understood that the US–China relationship has shifted in a fundamental way. Xi’s China is now well beyond the Deng era of peaceful rising. Xi has resurrected a Chinese Communist Party that was drifting into irrelevance and corruption. To the people of China, he’s made it clear that the way to prosperity in China is through the party, while the way to prison and disgrace is through asserting any independence from it. To the nations of the world, he’s made it clear that the path to trade with China is also through the party—and that criticism of the party can bring all kinds of obstacles and pressure. Xi is overconfident enough to have a public and detailed agenda of overturning US technological leadership and centralising the world economy in China—all while ensuring that China exploits others’ intellectual property for military and economic dominance but shares less and less of its own. This is the ‘Made in China 2025 ’ agenda and its twin, civil–military  fusion. Beijing is also willing to risk conflict in the South China Sea with the US administration. Last week’s Decatur incident showed that in a tactical way. Beijing’s continued fortification and movement of military systems to the artificial islands it has constructed in the South China Sea show it on a bigger scale. But this China news is old news, even if it’s not well understood. The new news is that the US now has an emerging counterstrategy. And it’s by no means coming from just Trump. We’re seeing the start of a strategy that is unifying US policymakers and large chunks of the US corporate world and the US public. American sentiment on China has reversed since 2006. Back then, 52% of the US public had a favourable view of China, while 29% held an unfavourable view. Now, only 38% hold a favourable view, while 47% hold an unfavourable view of China, both militarily and economically—but a growing number of Americans are more concerned about China’s economic strength. On strategic matters, it’s not just the US national security strategy or national defence strategy. We will see a more assertive US military stance against the PLA strategy—and we’re likely to see an early manifestation of that in coming weeks in the South China Sea and perhaps even around Taiwan. The big new news is the emerging US economic strategy of creating incentives for supply chains to shift out of China, either back to the US or into third countries to reduce their dependence on the Chinese economy. The current sanctions are the start of something, not just a trade dispute that can be resolved through Chinese and US compromises. The BUILD Act  passed by Congress aims to give the US corporate world what it needs from government to compete more aggressively in South and Southeast Asia—to provide an alternative to China’s BRI, but maybe more importantly to refocus supply chains out of China and into the US. The Pentagon’s review of supply chains  for military capability is another element. Trump isn’t interested in compromising on regulatory intricacies with the Chinese state. Both he and the Washington policymaking community know that Xi is like Margaret Thatcher—‘The lady is not for turning.’ As leader of the CCP, Xi is a true believer in China’s destiny—to be led eternally by a single party and to become a hegemon that all other powers respect by obeying. Trump, the Washington policymaking community, and more and more of the US corporate world judge that conciliation on Xi’s strategic and economic agenda will result only in US diminishment. And that is not their plan. The US intends to create the conditions for its strategic and economic success by beginning the difficult process of disentangling the American and Chinese economies, with all the consequences that will have domestically and globally. The tariffs are step one in a long journey of ‘crossing the river by feeling the stones’. The new free-trade negotiation with Japan is another. The US economy is much more deeply enmeshed with China’s than the Australian economy is—because of the complexity of the global production chains of many US businesses, from traditional manufacturing to the tech world of Apple and Amazon. But, in some ways, US policy is going with the grain of global economics and technological change. China was already becoming a higher cost manufacturing centre than countries like Vietnam and the Philippines. China’s economy has started experiencing the consequences of high debt and environmental damage from its decades of fast growth. Its ageing demographic is starting to bite and will sink its teeth in much deeper over the next decade. And the pace of innovation will likely be slowed by Xi’s reassertion of the dead hand of the CCP over Chinese entrepreneurs. In contrast, the US has a growing youth population (unusually for a developed economy), a highly innovative tech sector and a buoyant economy. And, unlike the Chinese state in the past few weeks, the US hasn’t had to commit to fiscal easing to keep momentum in its economy. Onshoring of manufacturing and the rise of more complete automation and Industry 4.0 are all existing phenomena that will help the US. Australian policy settings and public sentiment do not position us well for this new world. We want the world to stay as it was—where we can sell resources, education and tourism to a growing Chinese economy and talk occasionally about mutual benefits with minor areas of difference over strategic matters. The Australian business community continues to see nothing but upsides in engaging with China, while academic opinion is mixed. One recently said that Donald Trump’s policies on China in effect made him ‘the enemy of the Australian people’ . According to Lowy polling, Australian sentiment  on Chinese investment has hardened: 72% see it as a problem, up from 56% in 2014. But while 63% of Australians are concerned about Chinese interference in Australia’s politics, 58% are concerned about US interference. We need to get ready very fast for changed demands out of both Beijing and Washington. Beijing will want us to show that we are not part of this new American world, while Washington will want to see that we are. It won’t be good enough for us to urge a middle way. Every part our economy, even those most closely associated with China—whether resources, the financial sector, education or tourism—is connected in some way to the US, so a shift like this will ripple through our entire economy. It won’t shock you to know that I see the path for Australia here to be diversifying our economy away from its heavy current concentration on the single China market—re-engaging with the US economy in a deeper way, and also growing our economic relationships with India, Indonesia, the rest of Southeast Asia and Japan. I don’t want to live in a world where the price of prosperity is agreeing with the CCP. Economic diversification will help, but the other element in Australian policy will need to be strengthening our policies and regulations in ways that align with the new US competition with China. Some examples. The new foreign interference laws aimed at reducing Chinese and other state influence over domestic decision making are a good start. So too is a set of recent decisions rejecting Chinese investment in critical infrastructure and telecommunications. But the new world will require more, and bigger, shifts. It will certainly mean controlling our research interaction with the Chinese state—particularly to ensure that we don’t actively advance PLA capability. We’ll need to shift our defence relationship with China away from deepening military exercising back to more limited senior contact to explain policies and reduce misperceptions. We should commit to joint patrols with allies and partners in the South China Sea, and actively push back at the growing Chinese military interest in the South Pacific. Our industry and export policies will need to align well with US policy if, instead of being a victim, we are to benefit from the US strategic and economic disentanglement with China. This means taking steps to integrate policies and regulations to allow Australia and the US to actually share our national research, technical and industrial bases . For this we’ll need something new: a whole-of-nation approach to the Chinese state under Xi and a renewed and broader US economic relationship as part of our US alliance. Michael Shoebridge is director of the defence and strategy program at ASPI. Image courtesy of the White House on Flickr.